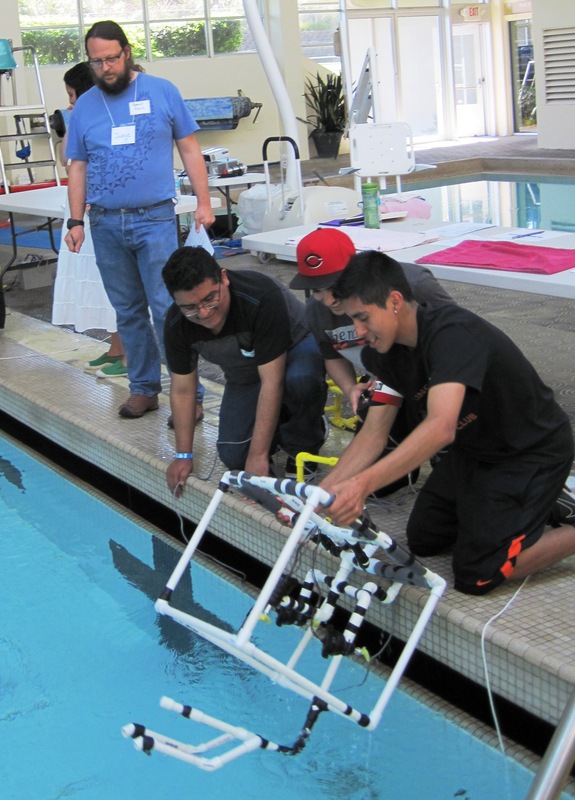 LINCOLN CITY – —More than 150 elementary, middle school, high school and college students in 27 teams bring their underwater robots to the Lincoln City Community Center on May 10 to compete in the annual Oregon Regional MATE Remotely Operated Vehicle (ROV) contest. The event is free and open to the public. The teams, which have spent the past few months designing and building the underwater vehicles, join students around the world participating in 23 regional contests supported by the Marine Advanced Technology Education (MATE) Center. Qualifying participants will earn the chance to advance to MATE’s International ROV Competition June 26 – 28, at the Thunder Bay National Marine Sanctuary in Michigan. Coordinated by Oregon Sea Grant, the Oregon Regional MATE ROV Competition encourages students from Astoria to Bandon and Bend to The Dalles, to develop and apply science, technology, engineering and math (STEM) skills as they work collaboratively to create working ROVs—tethered underwater robots used in ocean exploration, scientific research, and marine technology industries—to complete missions that simulate real-world tasks. This year’s competition is thematically organized around the role of ROVs in exploring and documenting shipwrecks and conserving national maritime heritage sites such as the Thunder Bay National Marine Sanctuary, where more than 50 shipwrecks are submerged. The competition helps students understand how chemical, biological and physical conditions can affect such archaeological sites. Competing teams participating will perform a variety of underwater mission tasks, piloting their ROVs to identify a simulated shipwreck, collect microbial samples, inventory invasive species and remove debris. Students are challenged to think like entrepreneurs and form companies that develop creative solutions for engineering and constructing an ROV to document and explore a newly discovered wreck site. During the process, the students develop the teamwork, creative thinking and problem solving skills that make them competitive in today’s global workplace. The project requires them to solve problems in new and innovative ways, work as part of a team and understand all aspects of business operations—important 21st century skills. Teams from the following schools and organizations are participating in the competition: Bandon High School, Cheldelin Middle School (Corvallis), Clatsop Community College (Astoria), Eddyville Charter School, Life Christian School (Aloha), Linn-Benton Community College (Albany), Meek Pro Tech High School (Portland), Oregon State University (Corvallis), Summit High School (Bend),,Taft 7-12 (Lincoln City), Tahola Middle School (Tahola, WA), The Dalles High School, Toledo Elementary, Toledo Jr/Sr High School, Waldport High School and Wasco County 4-H. 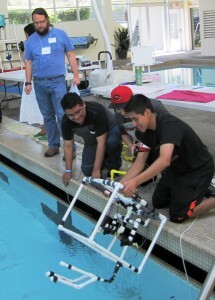 The Oregon Regional MATE ROV Competition is supported by many sponsors, including Oregon State University, the Oregon Coast Regional STEM Center, Lincoln County School District, the Marine Technology Society-Oregon Chapter, the Siletz Charitable Contribution Fund, the Cascade Chapter of the Association for Unmanned Vehicle Systems International, and Tanger Outlet Mall. Local marine technology professionals and engineers volunteer as judges for the competition, evaluating the students’ ROVs, poster displays, and engineering presentations. Numerous other volunteers donate their time each year, serving as divers and support staff for the competition, making it a community-wide effort. For more information, contact Tracy Crews at OregonCoastSTEM@oregonstate.edu.